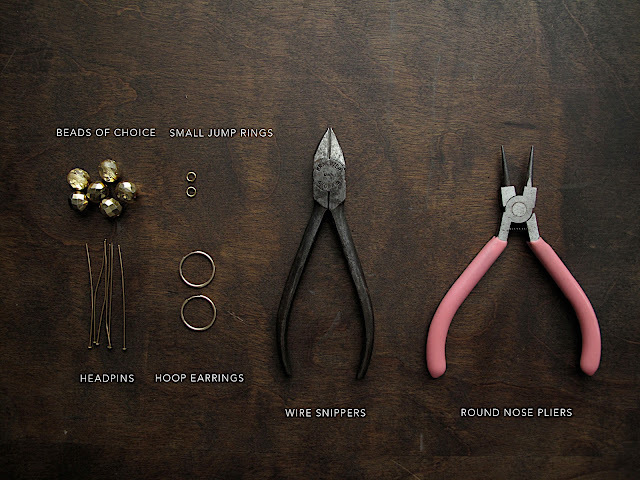 You don't have to have a lot of tools to make your own jewelry; just a pair of wire snippers (which come in handy for other projects as well) and round-nose pliers. The small investment in these two pieces pays for itself after just a few pieces. And if you have a bead shop in town, making yourself pieces is easy and very affordable. It also can provide for immediate gratification, something I'm very fond of. On this particular morning I woke up, and I wanted some earrings and a necklace, and had both within a few hours. Something else I'm fond of is getting 2 or 200 uses out of every one thing. These earrings work that way. I've created clusters that hang on a simple hoop earring. They can easily slide off and be replaced with another cluster of beads for another look. I keep a little dish of beads clustered or individual beads on head pins that I slide on and off of a base earring to make different looks without actually have 10 different earrings. Cut your head pins to 20mm in length (if you have a 10mm bead similar to mine) and insert them through the bead. 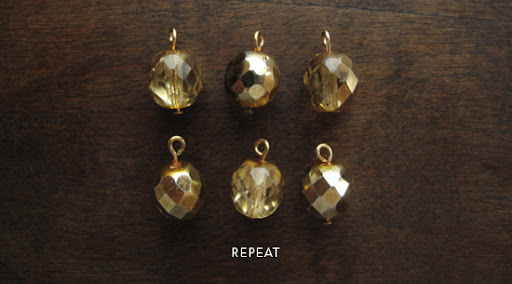 Then repeat for each of your beads. Open up a jump ring and place three beads. Remember to open jump rings by sliding the ends up and down from each other and not from the middle apart, this will keep the jump rings shape and not warp the metal as much. Repeat for your second jump ring. Slip jump rings on to your hoop and you're done! Bling, bling. awesome! these are so festive! very careful, thorough tutorials. thank you.